The first plant for ethanol and bioethanol in Bulgaria and Southeastern Europe is already a reality in town Alfatar, municipality Silistra. "Evroetil" AD builds the factory in Alfatar because the company processes in this region over 60 000 ha of agricultural land from which obtains the basic raw materials for manufacturing process - wheat, corn. Evroetil produces mainly ethanol and bioethanol. Ethanol is produced by conversion of carbohydrate biomass into sugar, which then turned into ethanol through fermentation. The fuel is used for internal combustion engines or as an additive to unleaded petrol and for medical purposes as technical alcohol. In the chemical industry the ethanol is used for petrol blowlamps, in the production of cleaning detergents for glass, chrome and plastics, in the printing industry, in the manufacture of paints and varnishes. The bioethanol has many advantages, such as: it is biologically renewable energy source, gives better results by higher octane number and efficient engine operation, reduces emissions, ethanol has no toxic components, sulfur-free, ignition without scaling, and mostly waste-free production. Ethanol is mixed with gasoline without further heat treatment. E 10 - contains 10% bioethanol and 90% gasoline, also does not require changes to the engine, this type of fuel is widespread in the U.S. and Brazil. E 25 - contains 25% bioethanol and 75% gasoline, requires minimal changes to the engine, in Brazil is mandatory the blending of petrol with 25% ethanol. E 50 contains 50% bioethanol and 50% gasoline, here are required changes in the engine, but this option is less common, yet started its imposition in the Nordic countries. E 85 - contains 85% bioethanol and 15% gasoline, severe changes are required in the engine, in recent years more and more car manufacturers put into serial production “FFV” models. One by-products of ethanol production process is the grain mash.This is high nutrient feed valued by the livestock industry worldwide (pigs, sheep and rearing of poultry ) . The proposed options of fodder are: wet option containing 8% dry substance, partially dried containing from 25 to 30% dry substance and dry option / DDGS / containing 90 to 92% dry substance. 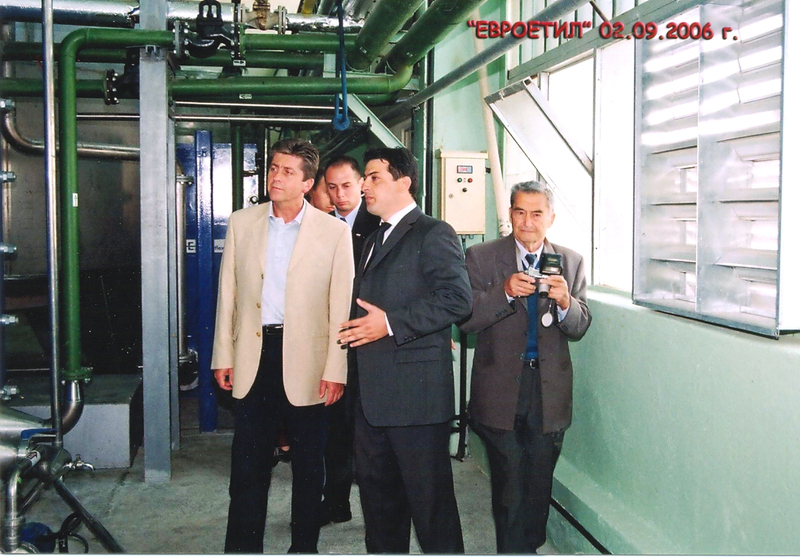 We started with a capacity of 30 000 l / 24 h., but the molecular separators and large part of the installation have a capacity of 120,000 liters / 24 h.
Bulgaria has great potential in this sector. Even with higher production cost than that of gasoline, bioethanol is competitive because it is exempt from excise duty and taxes. Euro Ethyl Ltd. (c) 2008. All rights reserved.